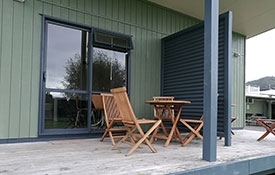 Prices are seasonal and great value all-year round – we become fully booked for Christmas and New Year, so in the summer bookings are essential. 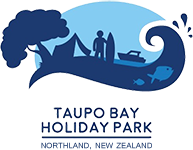 There are no shops in Taupo Bay apart from the seasonal small store at the Holiday Park for basics, and once you are here, you might not want to leave! Stock up before you come with all those basics that make a holiday. 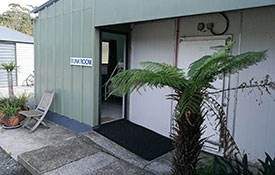 If you need something special, Mangonui is the closest store which is approximately 20 minutes away by car. Enjoy the 1.2 hectares of camp, offering plenty of shelter and shade. With a self-contained 2-bedroom cabin, kitchen cabins (no ensuite), basic bunkroom and power sites for your campervan as well as tent sites, there is something to suit every holidaymaker. We have a fantastic BBQ area where you can enjoy the catch of the day or prepare a meal in our camp kitchen. 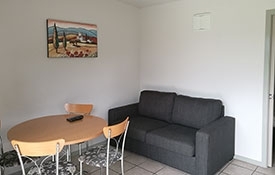 We also have a TV room with Freeview and a book exchange for you to enjoy. We have a small store which has a range of basic supplies available during summer, so ensure you are stocked up on all the things that make your holiday so you can stay and relax or start your beachside adventures. Prices are seasonal and great value all year round. Due to the popularity of the park we become fully booked over Christmas and New Year. Please ensure you book in advance to avoid disappointment. 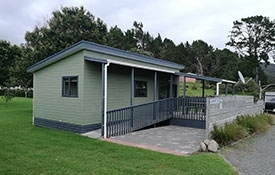 Fully wheelchair accessible, this 2-bedroom cabin is your home away from home. Two bedrooms, sleeps 6 people, queen-size bed in a separate room and a set of single bunks in another, a fold-out, double sofa bed in the living area, with full kitchen and bathroom all leading out onto a wonderful deck which is perfect for lazing away the afternoon with a great book or socialising with family and friends. 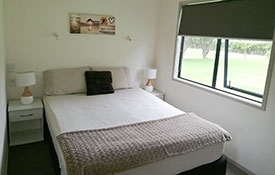 We provide a bottom sheet, pillow and pillow case; additional bedding to be requested for a small surcharge. Bookings essential. The kitchen cabins are perfect for people who want the camping experience without having to purchase all the camping gear or when it rains. 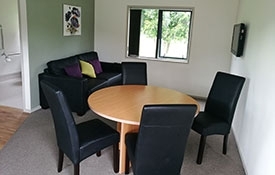 Sleeping a maximum of 5 people with a double bed and set of single bunks in the separate bedroom, and a fold-out, king single sofa bed in the living area/kitchenette. 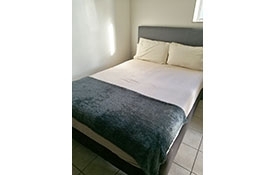 Fully equipped with cooking equipment, with a bottom sheet, pillow and pillow case provided, additional bedding to be requested for a small surcharge. 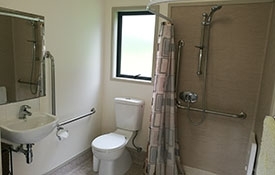 Please note there is no bathroom (shower or toilet) in the kitchen cabins. 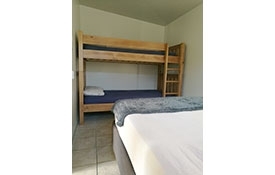 The bunk room contains a double bed and single bunk on top with an additional single trundle bed. 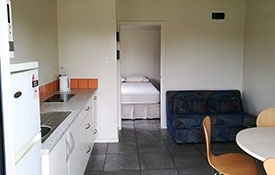 This provides affordable basic accommodation with access to all shared facilities. Cooking equipment can be provided for use in the kitchen. Bottom sheet, pillow and pillow case provided. Additional bedding to be requested for a small surcharge. 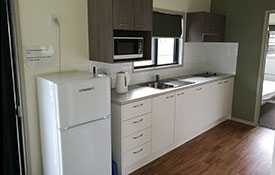 Power sites are approximately 9m x 9m with use of the shared facilities including kitchen with hot and cold water, 8 cooking elements, 2 large fridges, 1 food chest freezer, 1 fish bait chest freezer, toasters, kettles, microwaves, and free BBQs. Men's and women's bathrooms with ample showers and toilets, basins and mirrors, hot and cold water. These become a combined unisex bathroom in low season. Laundry with 2 washing machines and 2 driers. A fish cleaning bench and outside cold shower perfect for washing down after the beach. The TV room is fully carpeted with Freeview TV, loungers, tables, chairs, toys and a book exchange. The seasonal camp shop sells basic supplies, with takeaways and barista coffee available over summer. 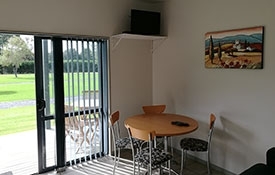 Non-power sites are approximately 9m x 9m with use of the shared facilities including kitchen with hot and cold water, 8 cooking elements, 2 large fridges, 1 food chest freezer, 1 fish bait chest freezer, toasters, kettles, microwaves, and free BBQs. Men's and women's bathrooms with ample showers and toilets, basins and mirrors, hot and cold water. These become a combined unisex bathroom in low season. Laundry with 2 washing machines and 2 driers. A fish cleaning bench and outside cold shower perfect for washing down after the beach. The TV room is fully carpeted with Freeview TV, loungers, tables, chairs, toys and a book exchange. The seasonal camp shop sells basic supplies, with takeaways and barista coffee available over summer. No animals till after January 21st. A minimum payment of 5 nights is required. ID bracelet to be worn at all times. Absolutely no animals allowed over this period. Extra parking: If you cannot fit all your vehicles on your site, we will charge $10 per night per vehicle on a limited amount of campsites. Showers are timed and operate on $2 coins or a token that can be purchased from the shop. You must be quiet after 10pm and before 7am. If you have no regard for others you will be asked to leave with no refund. However this is a campground, so expect some noise. Children are up to 14 years, 14 and over are classed as adults; we appreciate honesty. Children under 2 years are free. 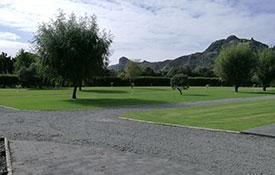 A maximum of 2 dogs allowed into the camp & must be on a lead at all times, sociable and quiet. A noise bond ($100 per site) will apply for all group bookings. We also cater for school groups or large group bookings at a discounted price.